You're on the finish line. Time to wrap it up. These resources will help. Questions? Check your Graduate Student Handbook. Graduate students have two opportunities to graduate each semester — fall, spring, and summer. For drop and withdrawal dates, please check the E -Services course schedule for each class. Last day to apply for graduation. Last day to schedule a Final Defense/Final Oral/Comprehensive Exam. Oct. 5 Nov. 9 Mar. 1 Mar. 29 June 7 June 19 Last day to complete Final Defense/Final Oral/Comprehensive Exam. Oct. 12 Dec. 7 Mar. 8 Apr. 26 June 14 July 26 Last day to submit Comprehensive Exam results or committee approval form from Final Defense/Final Oral. Oct. 12 Dec. 7 Mar. 8 Apr. 26 June 14 July 26 Last day to submit Culminating Project to the Institutional Repository for format review. Oct. 25 Dec. 20 Mar. 21 May 9 June 26 Aug. 7 Last day to submit final formatted and approved copy of Culminating Project to the Institutional Repository. Oct. 25 Dec. 20 Mar. 21 May 9 n/a n/a Last day for submission of final grades and clearance of any incomplete grades. Oct. 26 Dec. 21 Mar. 22 May 10 June 27 Aug. 8 Official graduation date. Dec. 21 Dec. 21 May 10 May 10 n/a n/a Commencement. Dec. 27 Dec. 27 May 15 May 15 July 3 Aug. 14 Last day for reporting grades. The School of Graduate Studies must certify that all requirements for graduation have been satisfied before your degree can be officially awarded. It is your responsibility to determine that all requirements for the degree have been met. Please review this list to determine that the requirements pertaining to your program have been fulfilled. Complete the Application for Graduation within the first two weeks of the term in which you intend to graduate. If you wish to participate in the commencement ceremony, register online once you have submitted the application for graduation. Confirm that you have been fully admitted to your graduate program and have met any conditions set at the time of your admission. Confirm that you are enrolled in at least one graduate credit in the term in which you intend to graduate. Confirm that you have a Program of Study approved by the School of Graduate Studies. Be sure that all the courses on your approved Program of Study were completed within the seven-year time limit. Your DARS report can assist with this process. Print your transcript. Check it to determine that all completed course work is included. If transfer credits approved as part of your program do not appear on your transcript, contact the School of Graduate Studies at once. Complete all courses on your approved Program of Study. Course changes must be approved by petition with an advisor signature. Verbal approval by your adviser is not sufficient. All incompletes must be completed and grades submitted by the instructor. Remind your professor to submit a grade change for all incompletes or IP grades. This includes field studies, theses, creative works, and starred papers. Check your transcript to determine if the necessary changes have been made. A 3.0 grade point average in the major/core plus research, the total program and overall graduate courses attempted at St. Cloud State must be recorded on your transcript. A 3.25 grade point average is required for the specialist degree in Educational Administration and Leadership. Students who have not achieved the required grade point average are not eligible to take either the oral or written final examinations. A grade of C- or lower or a grade of “U” cannot be used toward a graduate program. Courses offered at graduate study centers or through cohort groups established by the university . Established ITV and web-based programs. Individual departments may establish residence policies requiring a period of full-time study. Students should consult with their adviser. Some departments require a final written comprehensive examination for Plans A, B or C. Check with your adviser. Once all requirements are completed, the degree will be awarded and placed on the transcript. Diploma will not be released until all fees owed the university are paid. Student is responsible for updating their mailing address with St. Cloud State University prior to graduation. Diplomas are mailed about eight weeks after graduation by the Office of Records and Registration. Plan A: Thesis, Field Study or Creative Work. Deadlines are key. You and your advisor should develop and implement a completion timeline. Dissertation must be completed with the 7-year time frame to earn the doctoral degree. If you wish to participate in the commencement ceremony, register online once you have submitted the application for graduation. To participate in commencement and receive the graduation date for the application term, doctoral students must have completed all requirements for the degree, including final submission and approval of the doctoral dissertation, before the deadline for submission of the culminating project. Complete the application for graduation online. It must be completed by the deadline listed for the semester in which you plan to graduate and submitted to Records and Registration (Administrative Services 118) with the $30 application fee for master-level students and $35 for doctoral students. Failure to meet the deadline will delay review and processing. If you do not graduate during the application term, you must contact the office of Records and Registration to request a new term. No additional fee will be required. Students must be registered for at least one credit in the term in which they intend to graduate. 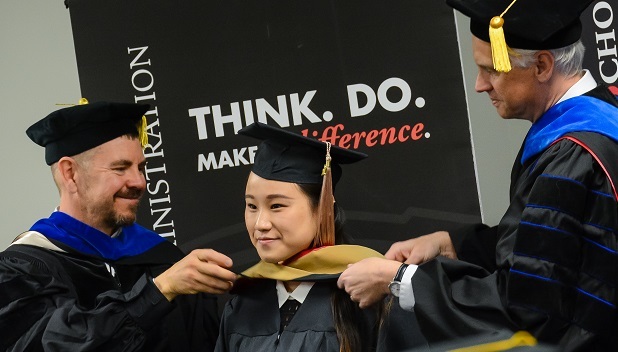 You can find information and RSVP online for Commencement. We encourage students to honor the centuries-old history of academic regalia by wearing the regalia appropriate to their degree and academic discipline. The American Council on Education provides guidance on appropriate academic regalia and its history. Caps, master's gowns and hoods can be purchased at the Husky Bookstore in Centennial Hall or at 320-308-1489 beginning in November/April. Doctoral tams and gowns can be rented and the hoods can be purchased at the Husky Bookstore in Centennial Hall or at 320-308-1489 beginning in November/April. Students wishing to purchase custom-ordered academic regalia should contact the Husky Bookstore. It can take up to 10 weeks for a custom order. Graduating students will receive their diploma in the mail about eight weeks after the end of the semester. All diplomas are mailed to the diploma address you provide through the Online Service center. If you experience difficulty in entering your diploma address, contact 320-308-2111. Students admitted to and completing a graduate certificate program can receive a certificate and have the certificate completion listed on their transcript. Submit Program of Study to School of Graduate Studies. Form must be signed by advisor and submitted before preliminary conference. Any transfer credits must be indicated on the form. All courses (including transfer credits) must be completed within seven-year time limit. Any course changes must be approved by petition. Complete All Course Work on the Program. All incompletes must be completed and grades submitted by instructor. A grade of C- or lower, or a grade of “U” cannot be used. A 3.0 grade point average is required in the major (core plus research), the total program of study, and cumulative (all graduate courses taken at St. Cloud State University). Submit Certificate Completion Application and $10 Fee. Your Certificate of Completion application is due within the first four weeks of the semester you wish to complete. The application is valid for one semester (a written request is required if students wish to change semesters). A graduate certificate will not be released until all fees owed to the university are paid. Student is responsible for updating their diploma mailing address with St. Cloud State University. Certificate students are not eligible to participate in Commencement.